Australian Alexa Camouro’s debut novel is a beguiling spy thriller with a twist. It is the women who are proactive this story and that is a welcome change from male-dominated spy tales where women are often victims or decoration. The first in a proposed trilogy, it features Dixon Grace, an Australian of Indian descent, who is teaching English and living with her German boyfriend, Ben, in Hamburg. 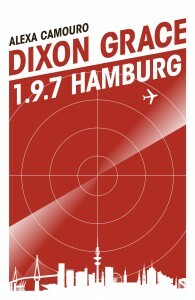 Although mostly set in September 2011, each chapter takes place in a different place and time, ranging from Dixon’s teen years up to her arrival in Germany. At first this is disorientating but slowly a complex picture forms although, tantalizingly, not all questions about this unusual heroine are answered. The novel hits the ground running with Dixon unceremoniously hauled into police custody (see the extract on this site). She is accused of industrial espionage, stealing secrets from aeronautics company, Flussair, where Ben works and she gives English lessons to its employees. Soon she is also being accused of murdering Ben’s boss with whom she had been having an affair. Her protestations of innocence cut no ice with Schultze, the stolid investigator assigned to her case. He is soon joined by Babette Korner, another investigator, who seems more willing to give Dixon the benefit of the doubt. However Dixon, a former police officer back in Australia, is not willing to wait for the wheels of justice to turn. She escapes from custody and begins her own investigation into the murder and the theft of Flussair secrets. Dixonis a terrific character. A seemingly innocent Australian ‘doing’ Europe by teaching English to fund her extended holiday, she also has a police background and high level aikido skills. She is brave but not foolhardy and regularly meets with a mysterious Indian professor who is connected with Nyakall, an Indian conglomerate that is trying to entice ex-pats back to their homeland to work. Nyakall’s boss, Devan Marawar, could be a megalomaniac intent on stealing industrial secrets from the West or he could be a generous philanthropist who wants to help poor Indians make better lives for themselves. The ambiguity of many of the characters is part of the novel’s charm. No one is all good or all bad, no one is simply innocent or guilty, although it has to be said that the men do tend to come off worst in the basic intelligence and empathy stakes. Throw in a Russian prostitution ring being run through the language company that Dixon works for and you have all the elements for a cracking thriller full of twists and turns. The novel has a surprisingly intricate structure for a debut but Camouro is confident and always in charge of her material. She deliberately omits certain information so that the reader has to try and work out exactly who is who and what is what which makes for a particularly engaging and satisfying read. The next two books in the series have a lot to live up to in this excellent page-turner.